Captains Drive-in Postponed. Due to the continues inclement weather, regretfully the Captains drive-in has been postponed until further notice. All will be notified as soon as the weather settles. Open 9 Hole Fixture; Due to the continuous bad weather the 9hole S/Ford Open competition will continue until further notice. Check with the course manager Liam Leahy 087-4115773 before commencing your game to see if the course is playable. Otherwise come in and play at any-time that suits you and you will be guaranteed a game. Fee; €5. Re-entry €3. All are welcome. Spring League Competitors List; The spring league is ready to commence once the weather settles. Names are now required onto the list on the notice board. Get you name in as soon as possible as there will be no delay on the start of the league. Good Outdoor Exercise; 9 holes + 2hrs. 18 Holes = 4hrs. Good Social occasions, Presentation Nights, Social Mixed, Senior Events and Away Trips. The Handicap System allows members of different abilities an equal chance of winning. Various Category of Memberships are available at different rates. (Membership rates are on our web site). Full Annual Membership €350 = Approximately, only 95c. per day. New members are the lifeline of the club, so all existing members are encouraged to tell all your friends to take up membership and test their skills on this challenging Golf course. Registrations Forms for new members are now available on-line on our web site, or at the club house or contact Martin Bohan 087 0509278 or any of the committee members. All are welcome. Seniors Deferred; Unfortunately due to bad weather conditions it was not possible to play on Thursday 25th. All will be notified of continued play as soon as the inclement weather settles. Volunteer Work; Volunteer work is now required especially on the bunkers. To remove the winter look off them by raking and weeding. “Just call in and get on with the work”. Your Swing Thought for the week; “Skip A Stone; The sidearm feeling of skipping a stone is a good thought for the start of the downswing, but a bad one through impact. It’s true that this image can help get the right shoulder to drop down on plane while the lower body rotates out of the way, both of which are desirable movements in the golf swing. However, the sidearm delivery associated with skipping a stone can also keep the right side down too long after impact, inhibiting the release and overstressing the spine”. 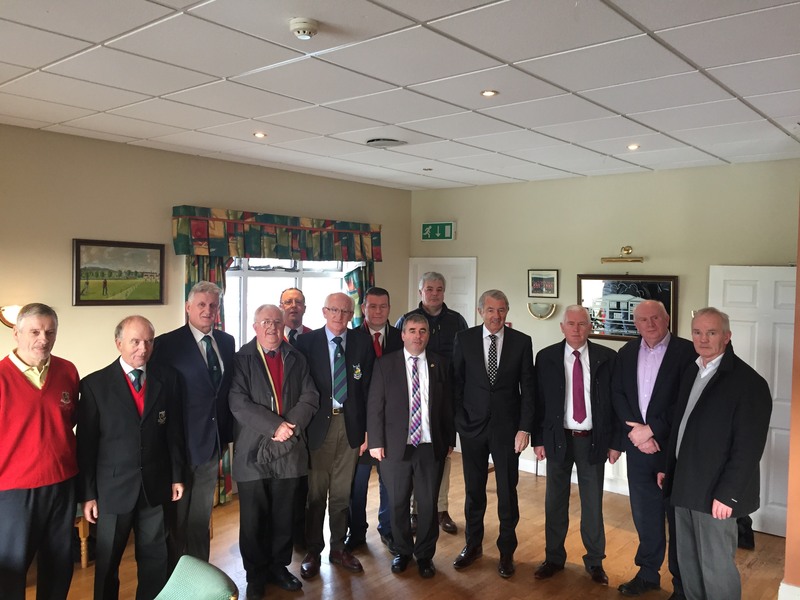 Templemore Golf Club Future Assured by Ministerial Meeting. 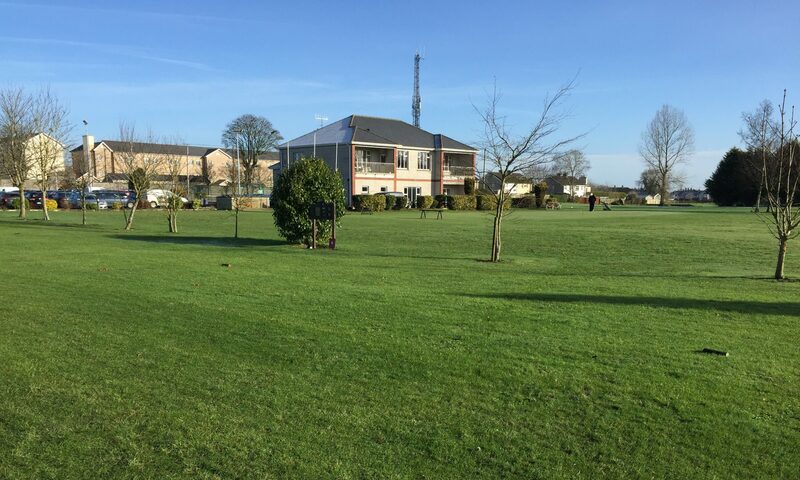 A fact finding meeting on the future of Templemore Golf Course in relation to future developments by the Garda College through the Office of Public Works was held in the Golf Club Lounge on Friday 19th February at 10am. with a site visitation by the Minister of State for the Office of Public Works, Mr. Kevin (Boxer) Moran TD. The meeting was very cordial and robust. A presentation from Templemore Golf Club was delivered by former Captain and Club Communication Secretary, Mr. Martin Bohan on the need for direct communication with the OPW to be established as soon as possible so that the club can plan its future. Lots of concerns were expressed on this issue from other club members, Conor Scott, Tom McGrath, Pat O’Connell, Liam Leahy and Club President Phil Ryan also highlighting the commitment by all members on a voluntary bases to the upkeep of the property and the enormous cost to the maintenance of the club by the club members and their voluntary time over the years. The Minister replied, very robustly, that the club now have a direct communication with his department and he gave his assurance that the department of the OPW will fully support the continuation of Templemore Golf Club so that it can secure its future. Mr. Allen Kelly TD also made a submission that the continuation of Templemore Golf Course will be fully supported by him into the future and expressed concerns on the overall parking dilemma in relation to Health and Safety on the site which needs to be addressed. Mr. Michael Lowry also made a submission on his continued support for Templemore Golf Club and expressed that he has made introductions to the OPW and the Garda College on other land site options that would favour any future development of the Garda College. Finally it was expressed by PRO Tony O’Toole that Templemore Golf Club is another Jewel in the Crown of Templemore and its future as a legacy for the youth of Templemore and environs and should be protected at all times. Government officials in attendance were; Minister of State for the Office of Public Works Mr. Kevin (Boxer) Moran TD. OPW officer. Mr. Derek Davaney. Mr. Allen Kelly TD. Mr. Michael Lowry TD. Mr. Jackie Cahill TD. Councillors; Joe Bourke and Eddie Moran. Representing Templemore Golf Club; President, Philip Ryan Snr. Communication Secretary, Martin Bohan. Hon. Secretary, Pat O’ Connell. Hon. Treasurer, Tom McGrath. Competition Secretary, Liam Leahy. PRO. Tony O’Toole and Sub Committee, Conor Scott. Captains Drive-in. The Captains drive in will take place on Sunday 4th. Feb.
All members are expected to support our Club Captains, Tommy Foley and Sara Hearne and make this a great solidarity start and support for the club for 2018. Open 9 Hole Fixture; Due to the continuous bad weather the 9hole S/Ford Open competition will continue until further notice. Come in and play at any-time that suits you and you will be guaranteed a game. Fee; €5. Re-entry €3. All are welcome. Spring League; The spring league is ready to commence once the weather settles. Names are now required onto the list on the notice board. Get you name in as soon as possible as there will be no delay on the start of the league. Seniors Report ; Due to bad weather conditions it was not possible to play on Thursday 18th. All seniors wish the best of luck and a speedy recovery to John Stapleton on his hip operation. We all look forward to seeing you back in action John as soon as possible. Winter Clean-up of Bunkers; Bunkers now need to be cleaned and the winter look taken off them by raking and weeding. “Just call in and get on with the work”. New President of Templemore Golf Club 2018. Statement from Mr Phillip Ryan Snr. I am honoured to be President of Templemore Golf Club for 2018. I wish to welcome all members in the club to an enjoyable year of Golf. It is my wish to be president for all members of the club and to help in steering the club in a positive, friendly and inclusive environment for 2018. I also congratulate our new Captain Tommy Foley, Lady Captain Sarah Hearne, Lady President Bernie Stapleton, also, to our hard working committee, Vice-Captain; John Stapleton. Hon. Secretary; Pat O’Connell. Hon. Handicap Secretary; Mr. John Greed. Hon. Competition Secretary; Liam Leahy; Junior Golf Officer; Pat O’Connell; Communications Officer; Martin Bohan; PRO; Tony O’Toole; Committee Members; Myles McMurrow and Rody Cawley. I look forward to working with them all in the coming year. Open 9 Hole Fixture; 9hole S/Ford Open competition is available up to 20th. January. Come in at any-time that suits you and you will be guaranteed a game. Fee; €5. Re-entry €3. All are welcome. 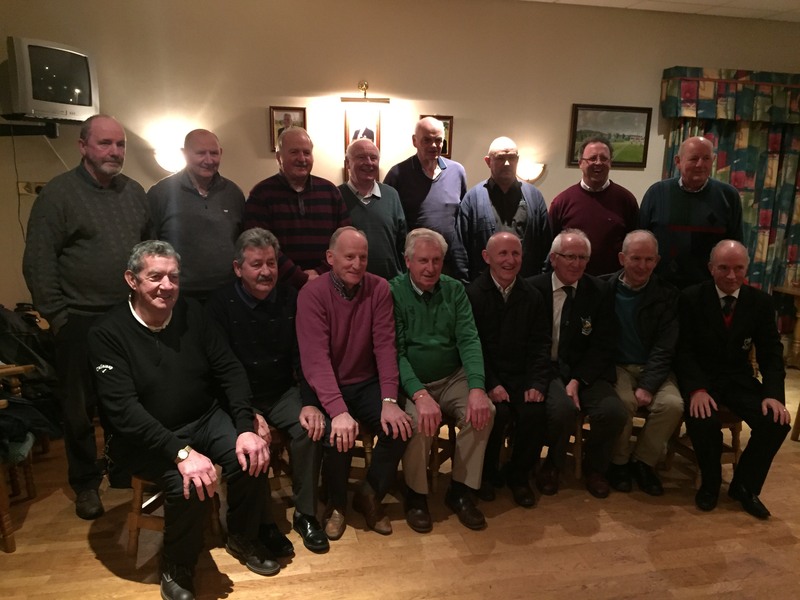 Seniors Report and Results; Despite heavy fog there was a great turn out of seniors who braved the elements which shows the enthusiasm in participating in this great social event. There was great banter and welcome refreshments after braving the cold elements. The club Captain Tommy Foley expressed a delight to see so many seniors back on the course and emphasised to all seniors to increase the numbers by introducing this event to all other golfers. The best of luck and a speedy recovery was expressed to John Stapleton on his hip operation and all look forward to seeing John back playing golf in the spring. Seniors results for wed. 20th. Dec. 1st. Team. Bertie Kane, John Mullaly, Mick Carey, Pat O’Connell. 2nd Team; Denis Tuohy, Phil Ryan, Tom Kennedy. 3rd. Team. Liam Daly, Joe Tynan, John Galvin. 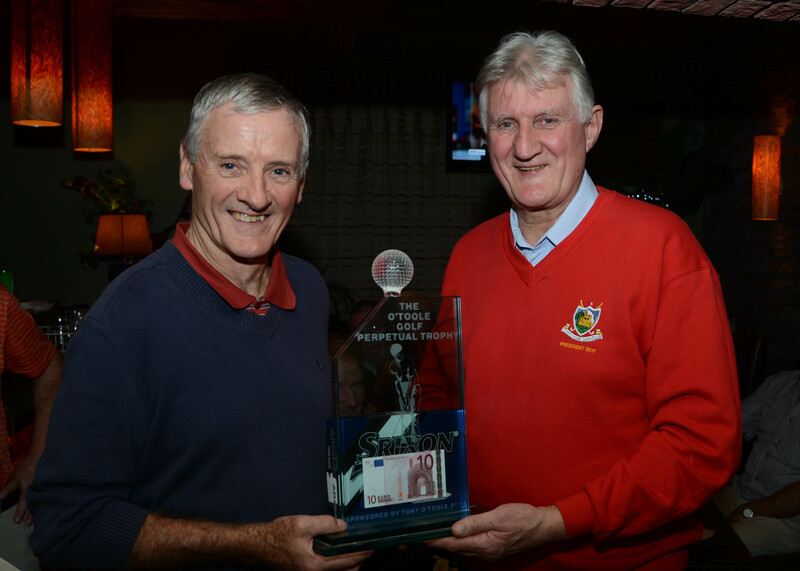 Tony O Toole presenting The O Toole Golf Perpetual Trophy to Tom Mc Grath at Templemore Golf Club.Photo:Seamus Bourke. 2018 Golf Season; A new year has arrived and our Captain Tommy Foley wishes all club members both Ladies and Gents a Happy, Healthy and a Great Enjoyable Year of Golf. Also his wishes are extended to all Seasoned Golfers outside of the membership and to beginners both individuals and families that want to play the great game of Golf in this fantastic 9 hole Golf Course in Templemore. It only takes 2hrs. to complete a challenging 9holes of golf. For all non-members there is an “open 9 hole competition available up to the 20th. Jan.” All members are encouraged to bring a friend and start the season competitively. You will be guaranteed a game at any time that suits you, and you will be very welcome. The club Captain wished all the Ladies the best of golf during 2018 and congratulations to all the new Ladies committee for 2018: Lady Captain Sara Hearne; Lady President Bernie Stapleton; Lady Vice Captain Lorraine Ryan; Honorary Secretary Kay Brennan; Honorary Treasurer Breda Murphy; Honorary Handicap Secretary Kathleen Maher; Competition Secretary Josie Moloney and Committee members Josie Bourke, Mary Butler, Ann Kenny and Maura Sheehan. All will be assured of the men’s club full support. President; Mr. Phillip Ryan. Contact; 087-0668060. Captain; Mr. Tom Foley. Contact; 087-1715692. Vice-Captain; Mr. John Stapleton. Contact; 086-0894718. Hon. Secretary; Mr. Pat O’Connell. Contact; 087-9205821. Hon. Handicap Secretary; Mr. John Greed; 087-0516941. Hon. Competition Secretary; Mr. Liam Leahy; 087-4115773. Communications Officer; Mr. Martin Bohan; 087-0509278. PRO; Mr. Tony O’Toole; 086-8209991. Committee Member; Myles McMurrow; 086-3679953. Contact any of the above by phone or preferable by text for any information or advice. Membership Subscription Rates for 2018. The following Rates were agreed to make the Game of Golf affordable to all sectors of the community both at home and away. Beginner, Gent;(Annual Rate for 3 years). €200. Beginner, Lady;(Annual Rate for 3 years). €170. Student: (3rd. Level & Student Garda.) €70. Unemployed; at the 1st. Jan. €270. Distance Members; (Lady & Gent, Outside 50k)€150. Family; (Children under 15yrs.) €500. Green Fees; (No reduction for 9 hole) €10. Green Fee; Junior Juvenile or Student €5. New members are the lifeline of the club, so all existing members are encouraged to tell all your friends to take up membership and test their skills on this challenging Golf course. Registrations Forms for new members are now available on-line on our web site, or at the club house or contact Martin Bohan 087 0509278 or any of the committee members. All are welcome. Men’s Singles Match play; The final stage between Jerry Keegan jnr. V Seamus Bourke has a result, and the congratulations go to the winner “Seamus Bourke” Seamus also congratulated Jerry Keegan Jnr. for been very competitive throughout the competition and wishes him all the best of Golf during 2018. Fixtures; 9hole S/Ford Open competition is available up to 20th. January. Come in at any-time that suits you and you will be guaranteed a game. Fee; €5. Re-entry €3. All are more than welcome. Seniors Report and Results; There was no Senior Scramble Golf on Thursday 28th. Dec. or 5th. Jan. due to the adverse weather conditions. Hopefully it will commence this Thursday 11th. Jan. All will be notified. John Stapleton on behalf of the committee expressed a happy and healthy new year and a fantastic year of Golf during 2018 to all the Seniors and looks forward to seeing a full turn out for the next date, weather permitting. Seniors results for wed. 20th. Dec. 1st. Team. Seamus Bourke, Seamus Ryan, John Mulally, Tom Hogan. 2nd Team; Tom McGrath, Donal Golden, L. Mason. 3rd. Team. Michael Purcell, Pat O’Connell, Sean Lee, Mick Connell. Winter Clean-up of Bunkers; Bunkers now need to be cleaned and the winter look taken off them by raking and weeding. “Just call in and get on with the work”. Also other work is required. Contact John Stapleton 086-0894718 for information on where you can make a difference. Ladies Golf; The 45th. AGM of the Ladies branch of Templemore Golf Club took place on Wednesday 15th. of December. The outgoing Lady Captain Josie Bourke thanked the Ladies committee of 2017 and all Lady members who supported competitions and played on teams throughout the year. She introduced Sara Hearne as the new Lady Captain for 2018. Sara then took the chair and wished all members well for the new golfing season. She also wished the new Men’s Captain Tommy Foley and President Phillip Ryan Snr. the best of luck in the year ahead. Lady President Maura Sheehan then introduced Bernie Stapleton as Lady President for 2018 and thanked everyone for making her year so enjoyable. The Lady Competition Secretary thanked our sponsors and said how vital their role is in the running of the club. The men who worked tirelessly maintaining the course we’re also acknowledged and thanked. The new committee for 2018 is as follows: Lady Captain Sara Hearne; Lady President Bernie Stapleton; Lady Vice-Captain Lorraine Ryan; Honorary Secretary Kay Brennan; Honorary Treasurer Breda Murphy; Honorary Handicap Secretary Kathleen Maher; Competition Secretary Josie Moloney and Committee members Josie Bourke, Mary Butler, Ann Kenny, and Maura Sheehan. 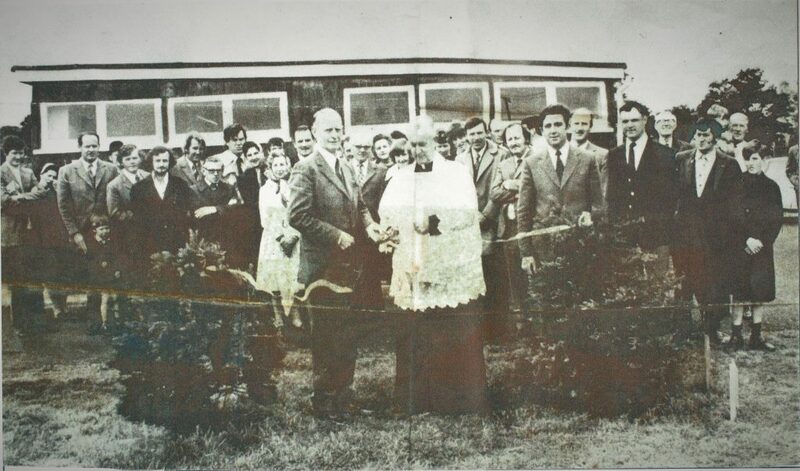 Presentation of Murphy’s Prize took place after the meeting which was presented by Francis Murphy to; 1st. Mary Hayes. 2nd. Mary Anne Maher. 3rd. Mary Hogan. Your Club Thought; “This is Your Club the members, both Ladies and Gents, therefore be proud and supportive of it, in whatever way you can that will make a difference. Be positive and protective of its future, so that the youth and next generations of Templemore will inherit the legacy and asset of this great sport facility, “Templemore Golf Club”.